If the trends for the first four months of 2016 hold true, growth for the U.S. IT job market will be way down from the past two years. The good news: IT hiring is still strong. The bad news: It’s shaping up to be a second straight year of decline. In its monthly analysis of Buearu of Labor Statistics data, IT employment analysis firm Janco Associates saw only 3,800 new IT jobs added to the economy over the course of April 2016. That’s down from last month’s 5,000 and much less than February’s highs of 9,000. It also means the year-to-date total for IT jobs in 2016 — 23,700 — is far off last April’s total of 49,900. 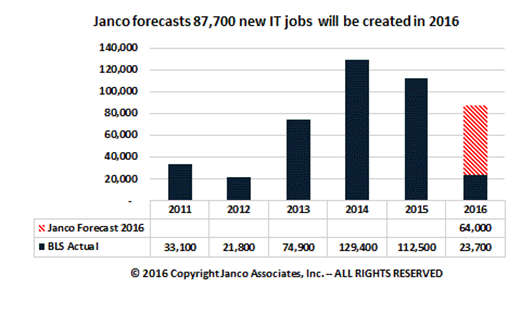 If this trend keeps up, Janco reports, this year’s IT hires may come in around 87,000 – down from 129,400 in 2014 and 112,500 in 2015. Janco crunched the last 13 months of BLS stats and found a decrease in IT hiring. Even without the 1,500 jobs lost over the course of last November and December, the trend is down. Over the past year, the three-month moving average growth trend for the market descended from 0.75 percent to around 0.33 percent. Forecasts for 87,000 U.S. IT jobs in 2016 will be markedly below 2014 and 2015. The first few months of this year have yielded employment growth numbers far below last year’s, albeit still positive ones. The slowdown has come over a time period where the economy overall has showed modest but regular progress. Despite hiring slowing generally in April, the unemployment rate has been fallen steadily for three straight years. IT job hires enjoyed a surge starting in 2013 that peaked in 2014 and softened in the two years since. Even if the IT job market shows relative slackening, the positions available within the market still command higher pay than in the rest of the economy and exhibit strong demand for expertise. A recent report by Dice.com and the Linux Foundation claimed a growing demand for IT jobs using open source skills, with cloud, containerization, and networking technologies among the most wanted. Finally, there’s the recently raised question of whether IT hires are simply being overlooked. IT employment analyst firm Foote Partners has examined the idea that BLS statistics no longer accurately reflect changes in the IT job market because the actual jobs in that field are being labeled differently by employers – for instance, as administrative positions.